SWF files can contain vector and video based animations and sounds. These files can be viewed directly in web browsers through the Flash plug- in. With the emergence of new playback platforms and media technology, this Adobe Flash file format is seldom played by common video media players and portable devices. MP4 is one of the most commonly used video formats today. This format provides high quality videos and better compression level that can be delivered everywhere, from desktop computers to mobile devices. You should seriously consider converting SWF files to MP4 format. A lot of mobile devices and media players now list MP4 as their preferred format. 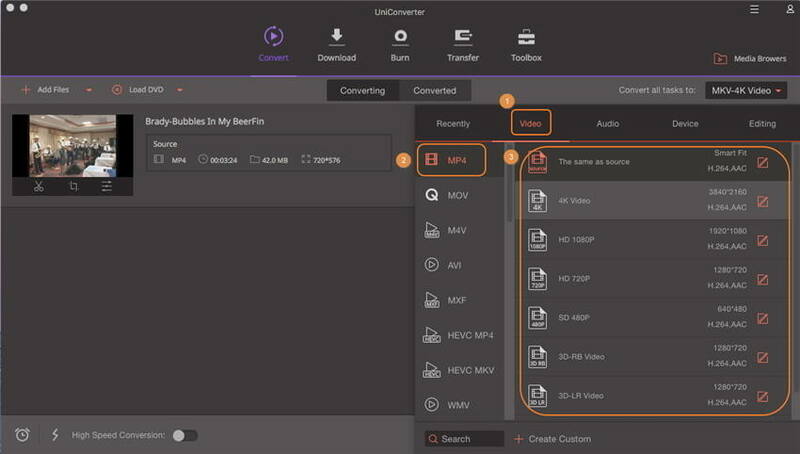 If you’re looking for a desktop version of an SWF to MP4 converter, then Wondershare UniConverter (originally Wondershare Video Converter Ultimate) is certainly recommended. It can convert videos between over 1000 kinds formats and export them to your selected devices. It's an easy and flexible DVD burner and converter and digital video converter for both Windows and Mac users. Using this tool, you can convert DVDs or videos from one format to another fast. It also allows you to target which device you want the videos to play with. Moreover, it converts videos at speeds over 30 times faster than other tools out there in market. SWF Converter for Mac can converts SWF files into MP4 and other file formats. You only need to choose the output format you want and you will have a converted video in no time. One of the best things about SWF Converter for Mac is that it has a clear interface. Output file types are categorized by device such as Apple devices, tablets and Android Phone. SWF Converter for Mac, however, doesn’t support batch conversions. This may be an inconvenience to some users. Overall, SWF Converter for Mac is a good tool that provides a complete solution to your conversion needs. You can try it for free or get the full version for $99.95. SWF format can bring incompatibility issues, but you can convert SWF files to MP4 so that it can be accessed in new mobile playback platforms and media players without using additional plug-ins. Here’s how you can convert SWF to MP4 on Mac with simple steps. 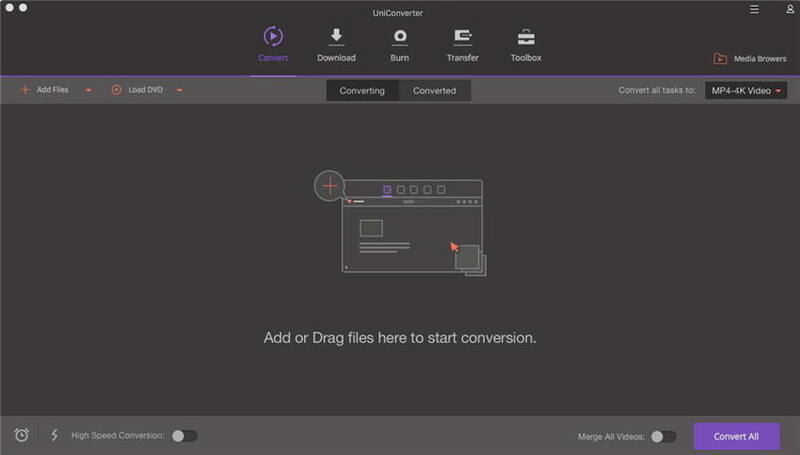 Rightly download Wondershare UniConverter for Mac (originally Wondershare Video Converter Ultimate for Mac) via the download button above, which is professionally designed to help you convert SWF videos to MP4 or other formats on Mac, such as AVI, ASF, WMV, FLV and MOV with high video quality. Launch it after installation, you'd get the primary interface as below. Click Add Files button on the upper-left corner to add the SWF files you want to convert, or directly drag your target SWF files and drop them to the program. Go to the Target Output Format section and click the drop-down button, then a drop-down list will appear with tabs of Recently, Video, Audio and Devie. To simply select the MP4 format, go to Video > MP4 and select the specific resolution in the right. 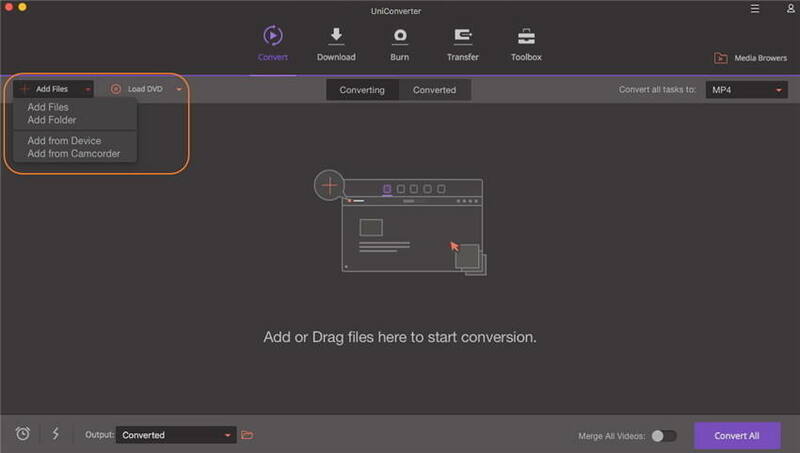 Click Convert to start converting SWF files to MP4 on Mac, when the conversion completes, switch to Converted tab to get the converted SWF video files.